It was an inspiring books and lunch! 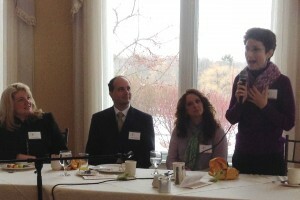 ​Those who attended Books & Brunch on March 15, at The Vista, were treated to an inspiring panel presentation: “Seeds of Change.” Passion for service to others, finding your flow, letting go of the past and embracing the present, and the merits of hard work were shared by panel members. Thanks to library Assistant Director, Kathy Adam, for moderating and to our panel members for sharing their authentic career and life changing experiences. It is never too late to make a change! For more: Photos of Books and Brunch 2014. Doug Plummer and Jean Bakkom presented a history of Sharon Springs, setting of Josh Kilmer-Purcell’s memoir: The Bucolic Plague. Plummer is the mayor of Sharon Springs and co-owner and co-renovator of The American Hotel. Jean Bakkom is past president of the Sharon Springs Historical Society. 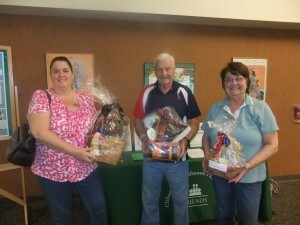 Thanks to all who contributed baskets for our Fall 2013 Basket Raffle at the FOL Book Sale. See more Basket Raffle 2013 photos. The Contenders were announced at 5 PM, September 11, 2013, at the Contenders Revealed Event in the Clifton Park-Halfmoon Public Library Community Rooms. 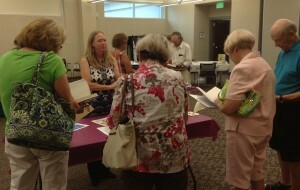 Community book lovers enjoyed the book detective game, refreshments, and children’s activities. Prizes were awarded! Click to see photos from Contenders Revealed 2013. Community members were eager to learn about the contenders and place their votes.